The war in the Land of the Faerie has finally ended. Prince Cassandra dispatches Stormwolf, formerly a Hound but cured by his prince’s magic and restored to the Rider he once was, to the Shadowlands to call home the People who remain refugees there. But Stormwolf finds the Hounds of the Wild Hunt now prey upon the souls of the humans, draining them of the magic which is the very lifeblood of the People. With the help of Valory Martin, a mortal psychic, Stormwolf must find the magic needed to defeat the Hunt before it’s too late. As a fan of the Violette Malan's Dhuyln and Parno series, I've been eagerly anticipating the next installment - especially since it ended on a cliffhanger. So far, no news on that front but at least Malan has something new coming out this summer. 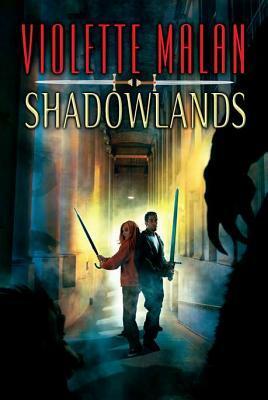 Shadowlands is the sequel to Malan's 2006 novel, The Mirror Prince, a book I read years ago and thought a real gem. So check it out, see what you think, and, hey, if you came over from Breaking the Spine, leave a comment so I can come visit your blog and see what book has you in a state of dizzy anticipation. I haven't heard of this but sounds exciting. The first one must of been about the war of the faerie which is always good action. I hope it's a very thrilling read, good choice. New follower. Very eye catching cover. I like the cover as well. I've never heard of The Mirror Prince or the author, but I'll definitely look them both up! This sounds exciting, definitely. I definitely recommend The Mirror Prince if you haven't read it already. It's a well-crafted novel with strong characters and an exciting plot.